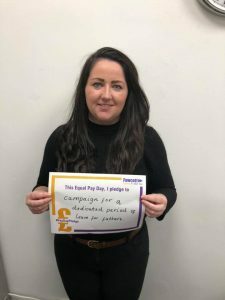 Equal Pay Day: Local MP calls for dedicated period of leave for fathers. On this year’s “Equal Pay Day,” Angela Crawley MP has called on the UK government to extend paternity leave for fathers. Equal Pay Day refers to the day of the year in which – as a result of the gender pay-gap – working women stop earning and men continue to. This year, Equal Pay Day was on Saturday 10th November – the same day as the previous two years. A recent report by the UK House of Commons Women and Equalities Committee argued that poor paternity pay and leave can force new fathers to go back to work while pushing mothers to stay at home for longer, undermining the drive for gender equality. It argued that as well as enabling fathers to play a more active role in childcare from an early stage, an effective policy on paternity leave is essential to closing both the employment gap and the gender pay gap for women in the workplace by giving working families more choice and flexibility and supporting mothers who want to return to work early. “Despite the Equal Pay Act in 1970, women still earn less than men in Britain today. “The current gender pay gap means women effectively stop earning relative to men on a day in November. “There are a number of measures that the Government could take to close the pay-gap and, as the Women and Equalities Committee report highlighted, one of the most pressing areas of underperforming Government policy is shared parental leave. “Despite it being one of the Government’s flagship policies in 2015, the take up rate has only been around 3 per cent. “The Tories want fathers to be more involved in, and take on more responsibility for, care of their children and it wants workplaces to support them to do this – yet it is clear their policy is failing.